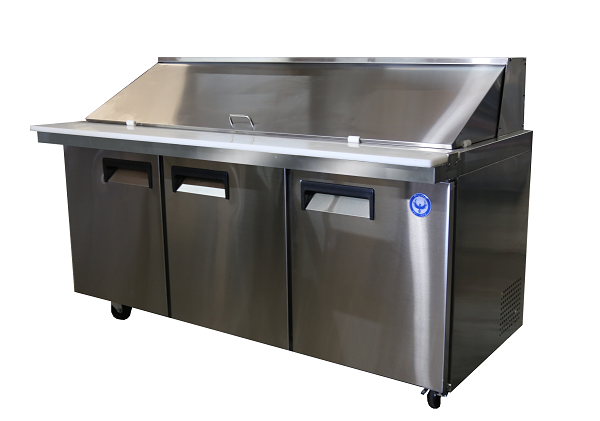 New Commercial Pizza Prep Table by PURE Manufacturing of Phoenix AZ, In Stock NOW! Not every restaurant is in need of a large pizza prep table. 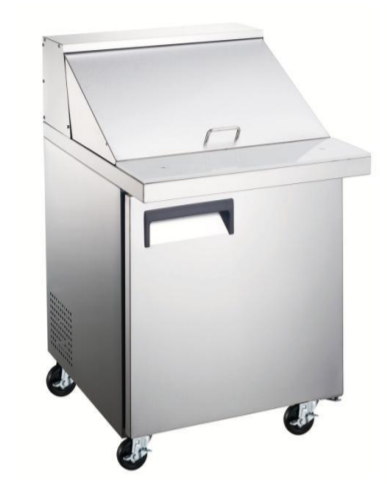 And if this is the case for your restaurant, then our 72″ pizza prep table is perfect for you. 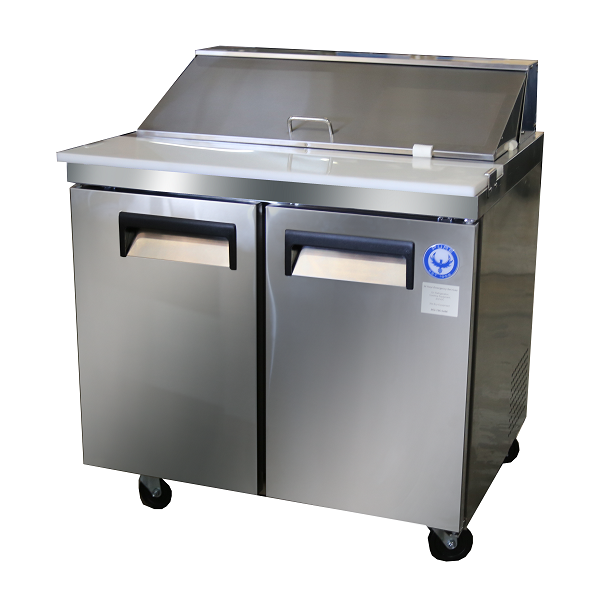 It comes with many great features you would expect in a more costly prep table, such as self-closing doors, an LED temperature display, and automatic defrost. Industrial casters make it easy to move the table to fit the needs of the kitchen. Compartment door easily comes off for cleaning. Doors are self-closing and can stay open at 90°. Recessed handle on the door makes it easy to open. LED temperature display shows the temperature of the table. 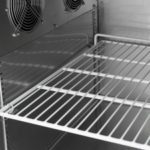 PVC coated wire shelves are durable and will provide years of service. Electronic thermostat controller is easier to use and is more accurate than analog controllers. 2.5″ polyurethane keeps the table insulated at all times. Door gasket removes, allowing easy cleaning. Compartment barriers keep food from spilling into storage area. 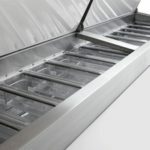 Lift-up lid is made of stainless steel. 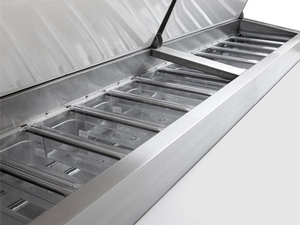 Internal louvers provide air circulation in order to keep the food fresh. Pans and cutting board come standard. 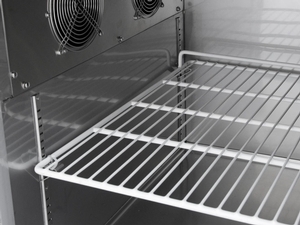 Automatic defrost reduces ice buildup. Stucco back panel is made of aluminum to keep the internal components secure. Refrigerant CFC-free R-290 is safer for the environment and reduces ozone depletion. 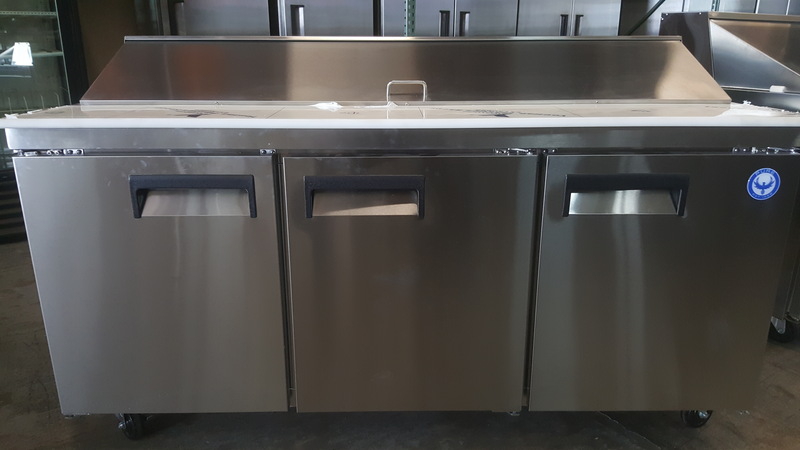 Stainless steel exterior and interior doors give the table a sleek look. 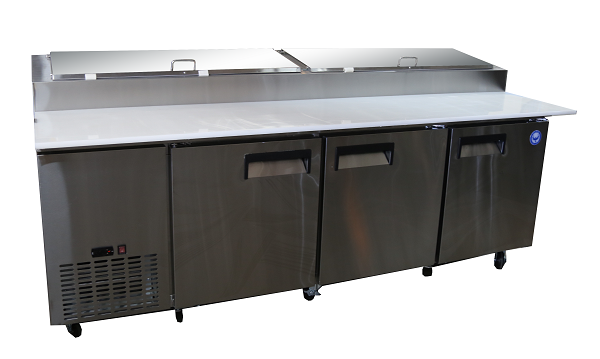 Temperature Range: 32° to 50° F.
Be the first to review “PPT92-HC 92″ Three Door Refrigerated Pizza Prep Table” Click here to cancel reply.